Has this top amazon seller sent me a speaker to replace my hi-fi system? I usually have music blasting in the background if I am home alone doing housework, my wife listens to music during her home exercise routines and whenever we are having parties it always helps to have some music in the background to keep the kids entertained. I suppose with it being 2017 it is time to move into the world of wireless and put this speaker to the test. Out of the box, the Aukey Portable wireless speaker looks and feels like a premium device with the smooth black rubber casing and the silver grills. This brick shaped speaker weighs 650.6 grammes and is 20.9 x 8.3 x 7.3cm (L x W x H). The speaker uses Bluetooth 4.1 and Aukey state you can get up to 30 hours playtime connected via cable or 12 hours wireless play with the 2600mAh lithium battery. On the right-hand side, there is a detachable handle which can be used to mount the speaker on a hook. When testing the speaker outdoors the 33ft wireless range opened a world of opportunity for summer BBQ’s. The Aukey Wireless speaker has not only impressed me, my wife and kids but other members of our family have been impressed by the sound quality from ‘the brick’ speaker. On a single charge, I have got two weeks worth of listening without having to worry about charging the battery, listening to the speaker for about an hour a day I have had no issues or problems. It currently has found a home at the kitchen sink with the splash proof grills it has made washing the dishes a more enjoyable task! 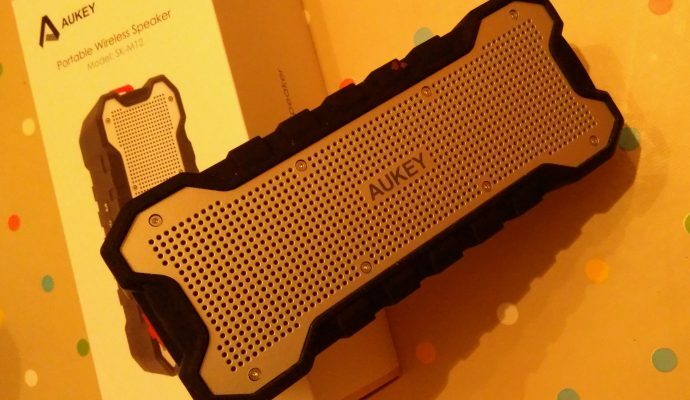 I would definitely recommend this Aukey speaker for £29.99 on Amazon this is truly a smart purchase and will hopefully be able to explore more of the Aukey range soon.